When the sun sets, kids don’t just immediately go to sleep. Often they look for something else to entertain them, so rather than plonking them in front of the iPad, why not suggest one of these fun camping games to play after dark? Pick someone to be “it,” and that person carries the flashlight. The person who is “it” counts to at least 30, probably better to do 50, while the rest of the children hide. Once done counting, the “it” person uses the flashlight to try to find people and shines the light on them to let them know they are out. You can play where everyone has to be found, and then the first person who was “tagged” (or had the flashlight shined on them) is it, or you can just do it where whoever gets shined on first is then it. Also, it’s a good idea to set boundaries as to how far each direction the children can wander. Using glow sticks and rings, you’ll need to set up the bucket or other receptacle for the rings (make sure it is lit up too) and hand each participant rings. Most discount stores carry glow sticks and rings, so purchase a bunch before you leave. This game could appeal to any age! P.S. You’ll find that glow sticks can help you play many other games at night, too! Be creative. Start out by giving a select number of players a glow stick, which they will wear around their wrists. (See, those glow sticks are already being used again!) The rest of the players have been “brainwashed” by aliens, and they are looking for more people to brainwash. Pick certain areas around the camp grounds for safe points where the glow stickers can rest. Also, pick two other spots that will serve as the alien base and the other as human zone where tagged aliens will hang out. The goal is for the glow stick people to “free” all the aliens, or for the aliens to capture all the glow stick people. Whoever does either first wins! Pair up players, and the two need to create a flashlight signal (for example, one short and one long flash). Partners separate and scatter throughout an area. Once someone shouts, “Go!,” then players begin flashing signals trying to find their partners as quickly as possible. The first pair to reunite wins. This easy, but fun game is a great one for night because you can just play with a few people sitting in a circle either in a tent or in a circle on your campsite. Telephone works this way: One person whispers short message to another player, then that person whispers the message to another player. The message is passed player to player until the last person announces it to the group. Because of how someone whispers or hears the message (or sometime people change up the message along the way for fun), the resulting message may be a hilarious version of the original. If you’re looking for more ideas and ones you can play during the day, check out our other post on camping games. 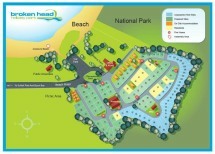 Bring the whole gang, family, friends or group for a fun-filled camping holiday at Broken Head Holiday Park. We have powered and non-powered campsites, as well as beach cabins, beach shacks and excellent facilities. Tour around the Bryon Bay Area during the day and soak up the fun, and plan to return to your campsite at night where you can play any of the excellent games above. Tag, you’re it!